AAPCO Group was brought in to assist the owners of Bryson Square in dealing with significant structural and water intrusion issues as well as perform a scheduled exterior paint job. 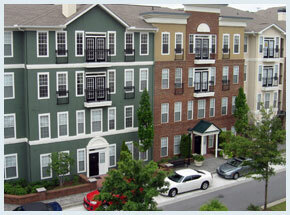 This project included full demo and reconstruction all of the "Juliet" balconies throughout the property. This included removal and reinstallation of the existing rails, framing the new structure, installing light-weight concrete and finally waterproofing of the new concrete. All balconies on the property, the reconstructed "Juliets" and the standard balconies that received no repairs, were waterproofed with a 3-part, Sonneguard waterproofing system that included substantial attention to the wall to floor transitions that had been an area of water intrusion. AAPCO is a certified installer of this system by the manufacturer Sonneborne. Due to additional water intrusion, our crews removed the existing brick row-lock and installed a new flashing detail at these areas. This required making significant alterations, to accommodate the flashing, to the area where the stucco walls transitioned with the row-lock and installation of new brick row-lock throughout the property. In addition to the stucco at the brick row-lock, AAPCO did stucco replacement on all of the chimneys at the property. The OSB sheathing between the stucco and the framing members was identified as rotten. Our team removed and reinstalled the existing chimney cap/spark arrestors, stripped the stucco from the chimneys and replaced the rotten sheathing. The structures then received a vapor barrier and a complete new stucco system. The property also received a full exterior paint system. This included caulking of all voids & terminations and painting of all siding, stucco, trim, doors, rails, etc. All of the French doors on the property were replaced as were some of the windows. All of the windows were re-flashed as well. We also installed Hardie Trim at all of the window openings. This project achieved everything the owners hoped for. The structural issues that were having a dramatic effect on the integrity of the buildings were fully remedied. The curb appeal was also enhanced and led to immediate results in the area of leasing, occupancy and ultimately, cash flow.